This great combo from Swissmar will ensure that you are always ready for snack time! Each set includes a 10" x 10" bamboo cutting board and a high quality cheese knife. 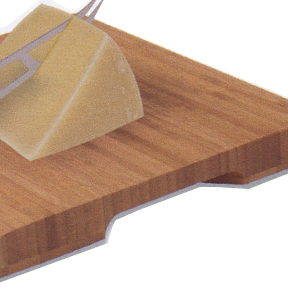 The cutting board is the perfect size for slicing and serving cheese and is very durable and easy to care for. It is a high quality cutting board that features cut out handles on the sides and slip-proof feet on the bottom. The stylishly curved cut-outs on either end make this board easy to pick up and maneuver, while the rubber feet keep the board secure during use. Since it is made out of bamboo, you know that it is an incredibly strong cutting board, but totally eco-friendly at the same time. 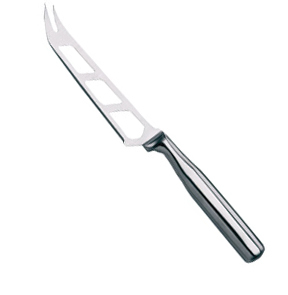 The included cheese knife is a Swiss designed, stainless steel knife made specifically for cutting soft cheeses such as brie, camembert, and gruyere. It will be fine cutting all other types of cheese too, but the design of this knife is intended to make cutting all of your softer cheeses a super easy task. No more squishing, and squashing of those delicate cheeses. The blade on this knife is so sharp that you will be able to easily cut through the outer rind without crushing soft interior cheese. Large holes through the blade prevents your cheese from sticking and ensures you will be able to achieve a nice clean slice. The blade is also slightly serrated to make cutting easier and it features a hollow, stainless steel handle. The combination of these two kitchen tools will make cutting cheese a breeze, and the superior quality and design make this board an impressive way to serve your slices too. Bamboo is not a tree, it is actually a grass that grows incredibly fast, but can be processed to form material that is stronger than traditional woods. In many cases it ends up being both stronger and lighter than wood that comes from trees. It is an environmentally friendly product that is 16% harder than maple, and ideal for everyday use. One of the many benefits to using a bamboo cutting board is that it absorbs very little moisture and will not shrink or swell when wet. It is also incredibly easy to care for. In most cases you just need wash lightly with a mild detergent in warm water. To make the board last a long time, it is also recommended to give it an occasional wipe with a food grade mineral oil. Bamboo is able to retain its natural color for a long time and will not dull your knives. Bamboo is a grass that functions as a single plant. It is able to self-propagate and it will spread out horizontally underground just like regular grass does. It will continually send up new shoots, and naturally replenish itself. When harvested, 1/3 of the bamboo taken will completely grow back within one year. This makes bamboo one of the most renewable resources known to man. The bamboo plant is not effected by harvesting parts of it, and it can achieve full growth in just three to seven years. A bamboo cutting board is a sustainable, cost-effective, and ecologically responsible alternative to a wood one. Glass cutting boards will often dull or damage quality kitchen knives, and standard maple or oak cutting boards are prone to nicking and scratching. This can be unsanitary because these small holes can be a breeding ground for bacteria and mold. Since traditional hardwoods don't dry quickly, it encourages further growth after washing. Bamboo Cutting Boards are naturally antibacterial, as the bamboo is harder than standard wood, and dries quickly to resist mold or food borne bacteria from being trapped within its surface. The result is a healthier kitchen cutting surface. Both products feature Swiss design and superior materials, so you know they will work well and last a long time. 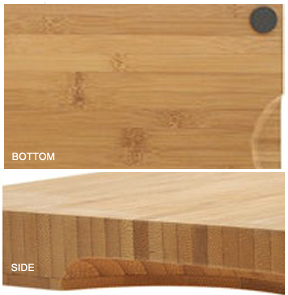 Thanks to the superior bamboo material and construction, the cutting board will outlast and outperform similar products. Save a tree by ordering your bamboo cutting board set today. Hand clean with warm water and mild detergent; dishwasher cleaning not recommended. Order Yours Today! 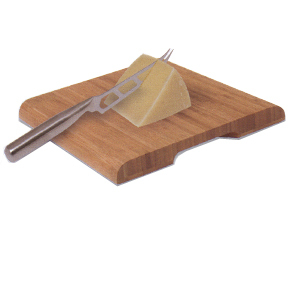 Board Dimensions 10" x 10"
Swissmar Bamboo Cutting Board &amp; Cheese Knife Set - High quality materials and superior craftsmanship make this Swiss made kitchen gadget a must have. A great accessory for anyone that enjoys cooking. Discover the benefits of using a high quality bamboo cutting board.